1929 Ditchburn centerboard yawl totally professionally restored. Engine: Volvo penta, MD17. Older engine low hours. 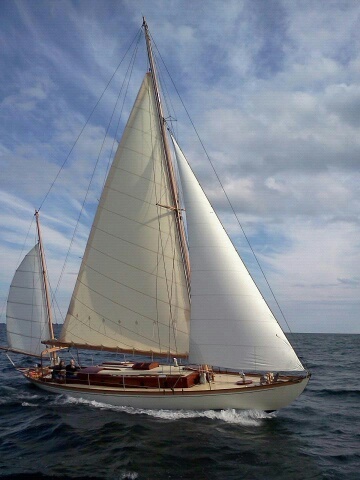 Rig Type: Fractional rigged bemudian yawl. Steering: Wheel worm drive Edson. Construction: Pine/Mahogany on Oak. Copper rivets. Sails: main 580 sqft new 2007, mizzen 150 2007,jib 170 good condition, small spinnaker, "balloon jib (genoa) original 1928 Egyptian cotton still in use! Tankage: Fuel, 60 gals plastic (2006). Water 50 gals plastic (2006). Holding tank 25 gals. Purchased in 2003 Portia has been been stored in a barn near Coburg for the previous 16 years where a resoration attempt had stalled. Between 2004 and 2007 current owner restored Portia II to cruising condition in a boatyard in Merrickville while working as a shipright. From 2007 to present Portia II has been actively sailing on Eastern Lake Ontario warters. Summer of 2015 Portia II spent on the hard in a barn in Iroqious, during such time the trunk cabin sides were replaced. Portia II is currently on the hard in Iroquois where it is wrapped up completing a mini refit. Owner has decided to move abroad giving this is a rare opportunity for the discerning classic yacht aficionado to acquire Portia II.